Since 1978, Tagg & Whiteman’s Engraving has been your local destination for customization and engraving, creating unique gifts and awards for any occasion! Our services include engraving and customization for plaques, trophies, shadow boxes, custom t-shirts, embroidery, screen printing, banners, signs and paddles. Contact us today to learn more about our capabilities! When the time comes to present an award or give a special gift, make sure you’re visiting Tagg & Whiteman’s Engraving. More than just dime store trinkets and generic awards, we help our customers pick out and personalize truly beautiful gifts and awards! Whether you’re presenting a company executive award or celebrating the achievement of your rising athletic star, we’re here to help with high-quality products and custom engraving in Havelock, NC. 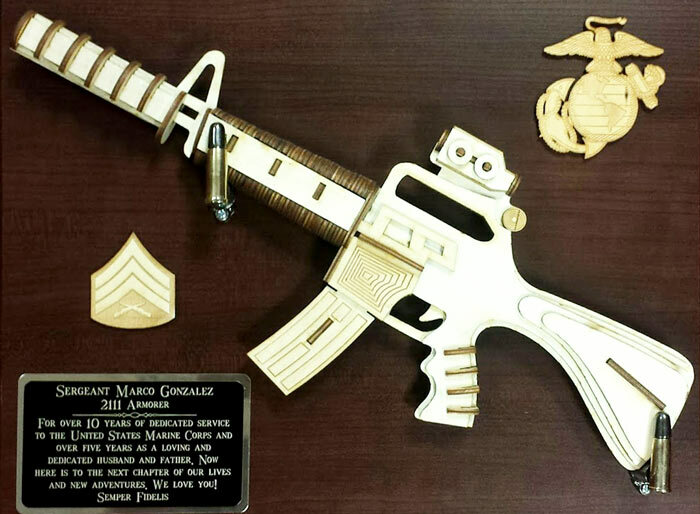 Our services include engraving and customization for plaques, trophies, shadow boxes, banners, signs and coins, among other awards. We have a precise laser engraver for all types of materials, and we’re the only company in the area with our own rotary engraver! When you choose us for trophies and awards, you can be sure they’re of the highest caliber. In addition to our work as an engraving company in Havelock, NC, we also customize t-shirts and apparel. We’ll help you screen print a large run of shirts for your next community event, or embroider shirts for your corporate employees. Again, we’re the only shop in the area with embroidering capabilities, making us the premier destination for quality work. If you have any questions, our staff is always ready to answer them, and we take pride in producing nothing short of perfection in all of the embroidery and engraving work we do. Visit us today and see for yourself everything we have to offer! We’re the only engraver in the area with a rotary engraver and we’re the only provider of embroidery services! Our business has been creating custom awards and gifts since 1978. All of our products are made in-house, meaning only our trained experts are handling your items. Our knowledgeable staff can help you decide what type of products are ideal for you and what type of personalization is fitting for each. From shirts to plaques, banners to signs and beyond, we’re the foremost destination for personalized gifts and awards! Stop by today and see what we have to offer.